For the last 20 years, Matthew Bauer has been a strong competitor at the Special Olympic Games. "[Matthew] does aquatics, and then he got into power lifting and he also does golf, so it keeps him busy year round," said Matther’s mother, Mary Alyce Bauer. On Saturday, Matthew was one of 300 athletes competing at the Fall Fest hosted at the PNC Sports Complex at Mount St. Mary's University. Matthew has Down syndrome but Mary Alyce says that has never stopped him from competing. "It impacts his ability sometimes to do what a typical person might be able to do, but he's very motivated. It just has broadened our horizon and especially his horizon,” she said. The university has hosted the fall games for 30 years, every year with the help of more than 300 volunteers. In addition to score-keeping, and escorting the athletes, volunteers say their most important responsibility is to forge new relationship. "We get to have these positive interactions like talking to them, giving high-fives and hugs, and just getting to know them a little bit better. [We ask] 'Why do you do this? Why do you love this sport? And why do you love Special Olympics?' 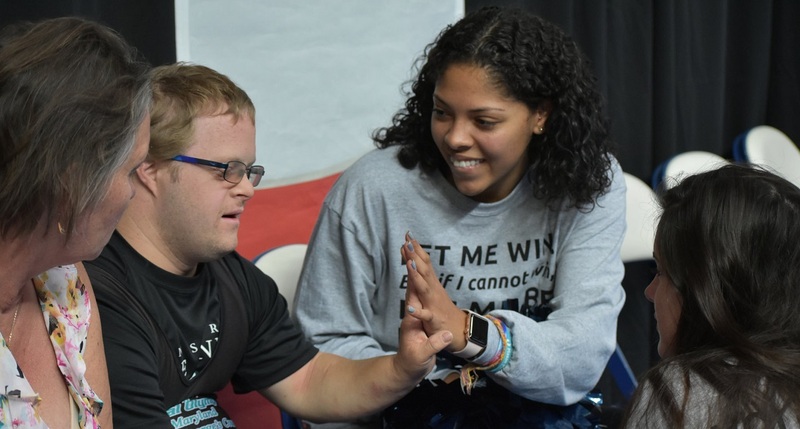 what they say and how we interact with them is like a great vibe for us,” explained student at Mount St. Mary’s and lead volunteer for the Special Olympics Fall Fest, Brandon Tieu. This year's fall games include five different sports like weightlifting, tennis, and flag-football. But when the organization began in 1968, things were a bit different. "We assumed that because they had an intellectual disability that individuals could not participate in sports. So we started with sports like track and field, and swimming and we've evolved to the point where today here in Maryland we offer 27 different sports," explained president and CEO of Special Olympics Maryland, Jim Schmutz. Over time the relationships that both athletes and their families share with one another have evolved and motivated them come back year after year. "[Matthew] has his friends that he's made through Special Olympics and the parents that we get to see all the time that we wouldn't get to see otherwise," Mary Alyce said.